Have you ever walked in the gym and wondered why there are some stupid giant rubber balls? Well, they are exercise balls and they are not as useless as you thought. In fact, they are a great addition to your workout routine, no matter which type of trainers you are. However, choosing the right ball is not always easy for everyone as there are some factors to consider. Don’t worry, in this article, I’ll bring you the 5 best exercise balls and show you how to buy one. What Should You Consider Before Making Any Purchase Decision? Improve Balance And Core Strength – Using an exercise ball or stability ball can result in improved stability. Specifically, the first thing you can realize in an exercise b​​​​all is that it is round, right? That’s why you have to use a lot of muscles, especially core muscle, and skills to balance on it, depending on what exercise you’re doing. It’s not easy at all to stay in one stable place with this giant ball, not mention to making different movements on top of it. Trust me, it’s much harder than you thought. However, as long as you practice a lot, you can increase the ability to balance. This way, you can also reduce the risk of back pain which is very common nowadays. 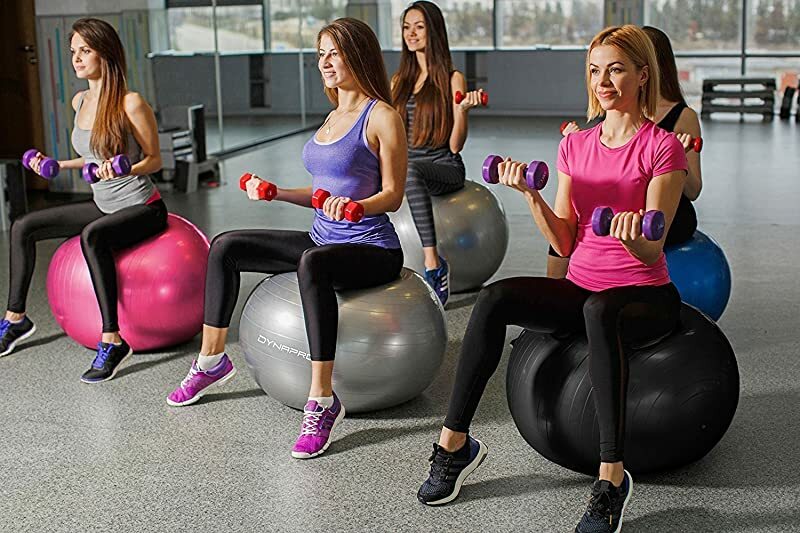 Target Different Muscles – Besides core muscles, using exercise balls also helps target other muscles such as chest, shoulder, back, legs, and any other major muscle group. This is because you can do so many different exercises with these balls to target any muscle group you want with minimal effort. Versatility – Even though working out with an exercise ball is quite difficult, anyone can add them to their own workout routine. There must be a reason why they are versatile, right? Well, the reason is that you can use them anywhere, at the gym, at home as they are inflatable and lightweight. Furthermore, they are also convenient as you can use them for different fitness levels, ages, and sexes without any maintenance. Stretch – Another benefit of using these balls is that they help with stretching. Working out with an exercise ball enables you to achieve proper stretching position and technique, unlike static stretching on the ground. Therefore, if you are looking great method of warming up your body or a complete stretch before an intense workout, this is a perfect choice. Wear A Shirt – This is not a problem for women. However, there are a lot of guys out there who want to take their shirts off while working out. Hence, remember to wear a shirt unless you want to sweat directly onto your ball, making it slippery and sweaty. Don’t Use Any Support – Keep in mind that the main purpose of this ball is to improve your stability, mobility, and flexibility. That’s why you shouldn’t use any support to work out with the ball, or else, it will be good for nothing. Choose A Safe Area – Exercise ball is generally made from rubber, thus, they are susceptible to being popped. Hence, please remember not to use them in a place where there is any sharp object around. This is not only safe for your ball but also for you in case you slip off of it and fall on the ground. Use Rolled Towels Or Exercise Mats – Your ball is likely to roll, no matter how flat the floor is, so you need to brace it with towels. Just place the towels or an exercise mat around the ball base. This way, you can prevent it from rolling and it will be much easier to do balance exercises. Once you get used to balancing on it, you can remove the mat. Besides, you can totally ask someone to help you hold the ball until you get into the position for the exercises. Pay Attention To Your Breathing – Normally, when you are trying to balance, you will hold your breath and that’s just a human instinct. However, what if you have to struggle to balance and it lasts a few minutes? Not so good, huh? Therefore, apart from focusing on balancing, don’t forget to breathe normally during the movement. You don’t know what to do or where to start? Well, don’t worry because choosing an exercise ball is quite simply. Actually, it all comes down to size and durability, very straightforward, isn’t it? The first thing you need to consider is size. To choose the proper size, you need to do some tests as it is not the same for everyone. Also, different people have different needs and preferences for their own workout routine. Here are my tips for you to choose the proper ball size. Make sure with your body weight evenly distributed, your feet can be flat on the floor. There should be an angle of 90 degrees at the knees and hips with your knees level or a bit lower than the pelvis. Ears, shoulders, and pelvis should be in a vertical line. Your body should not lean in any direction as a counter balance. If you need something more specific, here is a chart showing a general guideline for exercise ball diameter correspondence to height. However, besides the height, you also need to consider your body weight. If your body weight to height ratio is larger than average, you will compress the ball more. Hence, it’s a good idea to try using the next larger size to maintain the 90-degree angle. Also, remember that most ball sizes have some adjustability. For example, if your hips and knees create an angle of more than 90 degrees, you can release some air to compensate. Another thing you should care about is the durability of a ball. Is it durable enough to not slipping around? Well, best exercise balls will never pop while you’re sitting on them, no matter how heavy you are. Also, you need to choose a ball which you can sit on without slipping off of it. 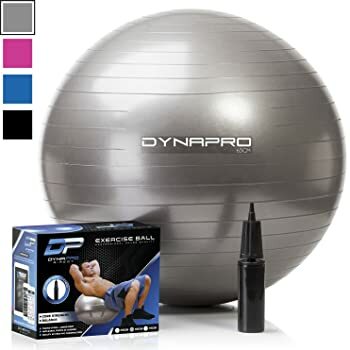 The Black Mountain exercise ball is one of the best exercise balls designed with durability in mind. It is able to support even up to 2000 lbs and give optimal support for any workout you need. This ball features neat little ridges providing some extra grip so you won’t slip off during the workout. This product comes in different sizes including 34. 55. 65. 75 and 85 in diameter. With a foot pump, you can easily inflate the ball. Furthermore, it can stay inflated as long as you want it to. With the durable material, I believe that this one can totally last a lifetime if well maintained. 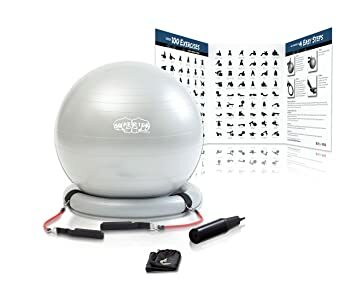 If you are looking for an exercise ball which is super durable and can help you target any muscle group, go for this one. 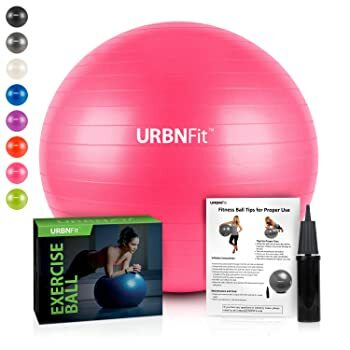 This exercise ball is suitable for use when it comes to balance, stability, overall fitness and yoga as well. It features an anti-burst design. This ball is also extremely durable due to the high-quality PVC material and can withstand up to 2000 lbs. Additionally, the product offers you a pump allowing for easy and quick inflation anywhere you want. There are multiple sizes for you to choose: 45 cm, 55 cm, 65 cm, 75 cm, and 85 cm. It also features a workout guide and 2 air stoppers so it’s very easy for you to use. 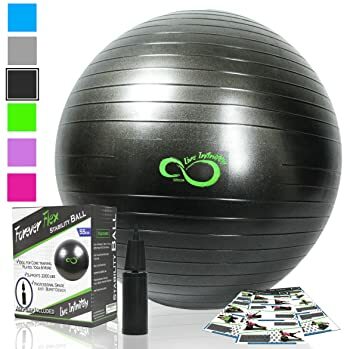 This Live Infinitely ball is both effective and reliable for your fitness needs, whether it is Yoga or Crossfit. This one is anti-burst tested and built out of grade PVC material which is professional. You can totally reach up to 2 cm cut and the ball will never deflate explosively. What makes me impressed in this product is that it can support 2200 lbs. That means this one is much more durable compared to most other counterparts with the capacity of 2000 lbs. Therefore, you don’t have to worry about your heavy bodyweight when using it. Besides, a hand pump, extra air plug and a valve remover toll will make it much easier for you to inflate the ball. Furthermore, you also have access to the online database of training guides and workout routines, therefore, achieving your fitness goal faster. When it comes to durability and thickness, this is one of the best. The ball is 1,877 micrometers thick and has incredible burst resistance and it can support 200 pounds. Therefore, this ball can help you with any type of workout you want. Even if there is a hole in this ball, it comes with anti-burst technology. Thus, it will deflate very slowly and you will be totally safe no matter what happens. In addition, this product comes in 3 colors and 3 sizes: 55 cm, 65 cm, and 75 cm. Just like most other products, this one is made out of anti-burst PVC material. It can hold up to 600lbs so it is not as strong as its counterparts with the capacity of 2000 lbs. However, it is still suitable for you no matter which type of exercises you do. Another great feature is that it is not sticky, so that your skin will never stick to it. Additionally, this ball also has an anti-slip technology, thus, you won’t have to worry about you sliding off of it. 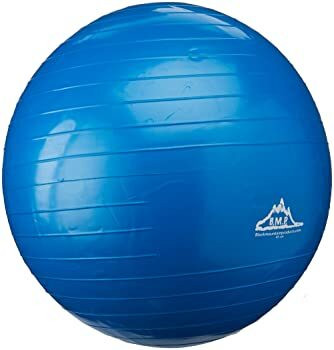 With a stability ring included, the ball does not move while you’re exercising on it. It has the perfect combination of stickiness and grip. Furthermore, there are resistance bands which help you do a lot more exercises. Is it still difficult for you to choose one? I hope that with my guide, it will be easier for you to buy one of the best exercise balls. Hopefully you guys enjoyed my article and found it helpful to choose the right product which meets your needs.